If you've perused around the World Wide Web at all recently you can see that teachers and parents alike are excited about the story of the Lorax coming to theaters this weekend. This Dr. Seuss classic (our love of Dr. Seuss continues as his birthday soon approaches!) written in the early 1970s is still as relevant today, if not more, as it was forty years ago. Through rhyme and vibrant illustrations, readers are reminded that greed and lack of concern for the environment can cause serious problems! 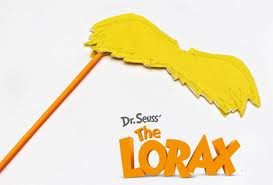 When the silly ole Once-ler ignores the wise Lorax, it becomes a environmental disaster. In my classroom we sit down with the Lorax around Earth Day in April, but with the movie about to hit the big screen this is a great time to do some Lorax activities. 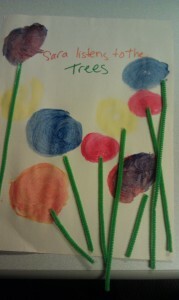 *Have your young artists make a Truffula Trees with cotton balls, paint, pipe cleaners, glue, and construction paper (or substitute recycled paper from the recycling bin or repurpose the inside of an old cereal box). *Take a trip outside to investigate some trees near you (they might be Oak instead of Truffula, but that's okay!). Click here for a free printable tree journal. 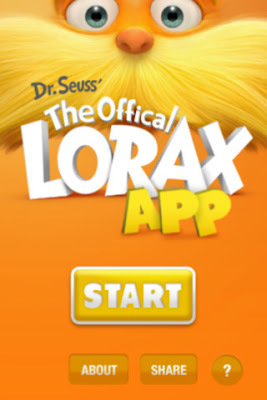 *Download the Lorax App to let kids give themselves a Lorax mustache. *If a digital stache won’t do the trick, make your own using this template. Kids can make a mask or attach the mustache to a pencil to channel their inner Lorax. *Let kids visit the official movie website and learn some Earth friendly tips. As a class or a family discuss some ideas that would work for your classroom or home. Have kids draft a family or classroom pledge. Encourage them to list a few things Earth friendly habits that they could do each and every day! I'm sure all teachers would agree that the book is always better than the movie. Sometime this week make sure to read the book to your kids. You're sure to have a lively conversation to follow. Concepts like nonrenewable resources and conservation are intertwined throughout Dr. Seuss’ rhymes and nonsense words. What a timeless tale to share with children of all ages, and a lot of us adults too!